Walking underneath a cascade of tumbling star shaped flowers, breathing in deeply, inhaling the exotically scented jasmine perfume, on a Summers evening as the night blooming jasmine bush releases its jasmine oil into the sultry evening air is one of my greatest pleasures ! The scent of jasmine perfume is sweet ,heavy and intoxicating, it arrests you and defies you to not to walk further without acknowledging and appreciating its beauty.Growing jasmine in your garden brings a fabulous aromatic accent to your outside space. Growing jasmine is easy to do. 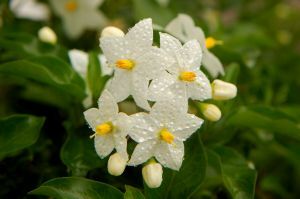 Choosing your Jasmine plant or Jasmine bush depends on wether you want Summer or Winter flowering Jasmine flowers, the three most commonly grown are Jasminum officinale, jasminum nudiflorum and Jasminum Sambac. 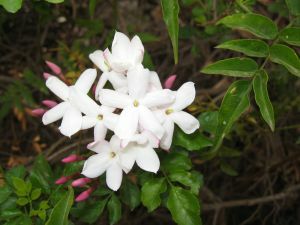 Jasminum Officinale , also known as Summer jasmine. A vigorous climbing plant, with white, heavily scented flowers, plant in the Spring or Autumn. Will grow up to 12 metres. Prune after flowering.Cuttings can be taken in Winter, hardwood cuttings fare better than softwood cuttings. Jasminum Nudiflorum, also known as Winter jasmine. The yellow jasmine flowers brighten any Winters day. Another vigorous climber which will grow to 15 metres, plant in Autumn or Winter. An easy plant to grow which is frost hardy. Prune in the Spring intermediately after flowering. Cuttings can be taken in the Winter to propagate. Jasminum Sambac ,also known as Arabian jasmine.It has beautiful white star shaped flowers.This jasmine bush is better suited to conservatories or greenhouses or indeed indoors as it is a sub-tropical variety.It will grow up to 3 metres. Cuttings can be taken in the Spring or Summer, softwood cuttings do better than hardwood cuttings.If planted in a container ensure drainage is good and a potassium feed is given monthly. Jasmine plants love the sun, so position your jasmine plants in full or partial sun,preferably against a warm wall, in well drained, fertile soil, that is sheltered from the wind until it is fully established.Water sparingly in Winter.Use organic seaweed and wood ash feeds to containerized jasmine plants, to boost potassium levels. Other varieties of Jasmine (that you may like to research) are best grown in a conservatory or very sheltered, warm and protected spots in the garden. Jasminum.beesianum, Jasminum.floridum, Jasminum.fruticans, Jasminum.mesnyi, Jasminum.polyanthum, Jasminum.stephanense. Please note that Jasmine berries are poisonous. Aromatherapy Notes for Jasmine Oil. In aromatherapy, Jasmine has been used for centuries as an aphrodisiac and for lifting the spirits, jasmine flowers in the East, a commonplace addition to hair and bedrooms and jasmine oil added to skin creams and skin care treatments. Jasmine oil is still used to aid childbirth and to relieve respiratory problems, in skincare treatments, the pure essential oil is wonderful for treating, dry and sensitive skin, it is used in anti-ageing creams. Skin treatments and skin creams containing jasmine oil are very good for stretch marks and scarring, the jasmine oil skin cream when used in massage can uplift spirits and help to alleviate muscular spasms and cramps. Care must be taken as most jasmine oils are no longer the absolutes and many jasmine oils will have been adulterated and therefore use should be for fragrancing only... pure jasmine oil is expensive ! Not only is jasmine oil used for perfumery, soaps and cosmetics but also within the food and drink industry for example jasmine green tea and jasmine rice. In China, the benefits of jasmine tea ( jasmine green tea is green china tea with dried jasmine flowers added to it),are said to alleviate the symptoms of headache ,stress, hepatitis and liver complaints. Jasmine rice is also flavoured and perfumed with dried jasmine flowers, it has a delicate taste perfect for light dishes. Jasmine Oil Body Scrub - Jasmine Oil body scrub, how to make jasmine oil body scrub, a gorgeous jasmine perfumed body scrub made with sea salt. Jasmine, Geranium and Sandalwood - a truly luxurious heavenly blend. Go to pure and natural Jasmine Oil Soap - beautiful Jasmine perfume soap, all the benefits of jasmine for natural skincare. Go to Jasmine, Geranium and Frankincense Soap - An exotic, uplifting and calming soap, wonderful for women !! Go to Rose, Jasmine And Patchouli Soap - a soap full of opulent, Eastern promise ! Go back to the home page from the Growing Jasmine page.